Pycnogenol is a natural plant product made from the bark of European coastal pine, Pinus maritma. Pycnogenol is rich in proanthocyanidins, a special class of water-soluble antioxidant flavonoids which are excellent free radical scavengers. 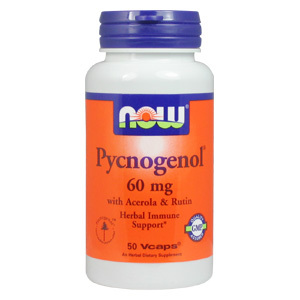 Numerous scientific studies have demonstrated that Pycnogenol helps to maintain vascular strength and function. In addition, Pycnogenol has been shown to support a healthy, balanced inflammatory response. A dietary supplement, take 1 Vcaps 1 to 3 times daily. Consider taking this product in combination with NOW Vitamin C, Vein Supreme and Rutin. Pycnogenol 60mg is shipped in a discrete, unmarked package. Orders are processed immediately and usually take about 3 to 5 working days to be received.. Any information received is used only for order processing and shipping purposes. Your information, such as e-mail address, will never be disclosed to a third party.